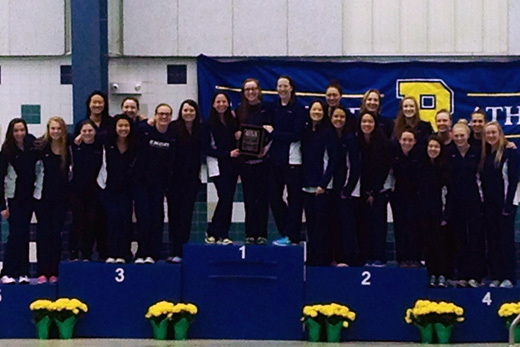 The Emory women's swimming & diving team claimed its 18th consecutive UAA Team Championship on Saturday night, the 24th such title in the history of the women's program. For the 18th straight year, the Emory University women's and men's swimming & diving teams were crowned University Athletic Association Team Champions as the 29th Annual UAA Championships wrapped up four days of events on Saturday night at the Webster Aquatic Center in Webster, New York. The women finished with 2,015 points, almost 700 points more than second place Washington University. The men tallied 1,595.5 points, more than 150 points better than second place Washington. It was the 24th title in the history of the women's program and the 18th championship overall for the men. Sophomore Cindy Cheng was named the Women's Swimmer of the Year after she won individual association championships in the 200 Freestyle and 200 Backstroke, both with UAA record times. Cheng was also part of the UAA Championship relay teams in the 800 Freestyle and 400 Freestyle, with both also setting new UAA records. She is the seventh straight Emory women's swimmer to win the award and 17th-person overall. Freshman Fiona Muir was selected as the Women's Rookie of the Year after she claimed individual event championships with UAA records in the 50 Freestyle and 100 Freestyle and earned All-UAA honors in the 100 Butterfly. Muir was also part of four UAA Championship Relay teams in the 200 Freestyle (UAA record), 400 Medley, 200 Medley and the 400 Freestyle (UAA record). Head Coach Jon Howell and assistants Cindy Fontana, Chris Marshall, John Petroff and Ross Spock were named the UAA Women's Coaching Staff of the Year for the third straight year and ninth time in the program's history. On the final day of events, the women claimed another five event championships, three UAA records and 11 All-UAA honors. Sophomore Rebecca Upton started things off taking gold in the 1,650 Freestyle. Cheng placed first in the 200 Backstroke and Muir won the 100 Freestyle. Senior Elizabeth Aronoff broke her own UAA record in the 200 Breaststroke and the 400 Freestyle Relay team of Muir, freshman Meg Taylor, Cheng and junior Marcela Sanchez-Aizcorbe closed things out, winning the event and shattering the previous UAA record. Adding All-UAA honors for the women on Saturday were sophomore Shelby Frugé in the 1,650 Freestyle (third), senior Ellie Thompson in the 200 Backstroke (third), Sanchez-Aizcorbe (second) and Taylor (third) in the 100 Freestyle, freshman Ashley Daniels in the 200 Breaststroke (second) and sophomore Megan Campbell in the 200 Butterfly (second). 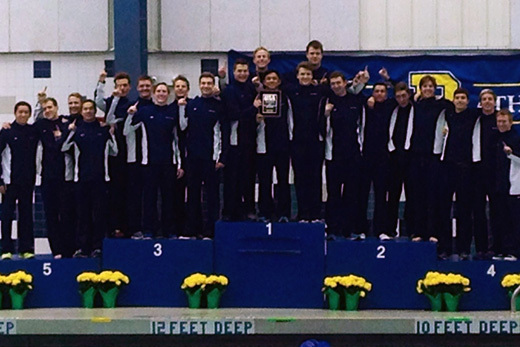 The Emory men's swimming & diving team won the UAA Team Championship on Saturday night for the 18th consecutive time. For the men, senior Jared Scheuer took home first place honors in the 200 Backstroke and freshman Thomas Gordon placed first in the 1,650 Free for the two individual men's event championships on the night. Freshman Trey Kolleck earned All-UAA honors in the 100 Freestyle (third) as did the 400 Freestyle Relay team of Kolleck, sophomore Alexander Hardwick, freshman Alex Kohlman and junior Hayes Burdette-Sapp and junior Christian Baker in the 1,650 Freestyle (third). Emory finished the four-day championship meet with 19 event championships, 10 UAA records and 45 All-UAA certificates. The Eagles now turn their attention to the NCAA Division III Championships, set for March 16-19 in Greensboro, North Carolina. But first, divers Mara Rosenstock and Emma Watson will take part in the NCAA Diving Regionals next weekend at Grinnell College in Grinnell, Iowa.